In bexio you have the opportunity to enter set products. This is ideal for products that are sold in a package such as a television + sound system, a computer + mouse + keyboard, garden chairs + a garden table or for products manufactured using other products (production products). To enter a set product, create a new product. 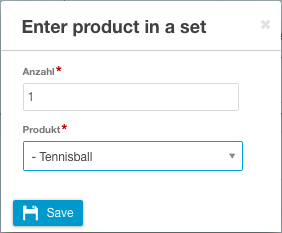 Then open the product and press the "Enter set product" button on the right side under "Actions". A window will open up where you can select the desired product and quantity. Confirm your selection by pressing "Save" and add the product. Repeat this step if you want to add additional products. All set products are then visible in the product including their product number, name and quantity. Once the set product has been created, bexio can automatically calculate the purchase price. To do so, however, all set products must share the same currency. To have the price calculated automatically, edit the set product again ("Pencil" icon in the upper right) and check the option "Automatically calculate purchase price" to trigger the calculation. The selling price, however, must still be entered manually. There are two possible uses for set products. You can use them to create both product packages (home cinema containing a television & sound system) or to depict production products (component 1 + component 2 = device 1). To create product packages, proceed as follows: If you offer patio furniture in your product tree that contains various other products like a "Patio table", "Patio chair" and "Patio sofa", for instance, you can create a product package using the set products. Enter the "Patio furniture" product package as a separate product. Now add the individual products it consists of as set products ("Patio table", "Patio chair", "Patio sofa"). You can now carry the "Patio furniture" product as a normal product or as an in-stock product. If you carry the "Patio furniture" product as a normal product and the individual components as in-stock products, when a vendor purchase order is issued for the "Patio furniture" product, the correct number of products ordered is only posted to the warehouse for the components ("Patio table", "Patio chair", "Patio sofa"). If the "Patio furniture" productis marked as an in-stock product and a vendor purchase order is issued, the number of products ordered is added to both the components and the product package in the warehouse. To depict a product, first enter the components required as in-stock products. Enter the set product as a normal product. If you now deliver the set product, the components are automatically posted out of the warehouse and if you order the set product, the components are automatically posted into the warehouse. If you want to see how many of a production product are still in stock, it gets a little more complicated. If you simply switch the product to "Is an in-stock product", you will have problems with inventories in the case of purchase orders and deliveries. If you deliver a production product that was entered as an "In-stock product", one product will be removed from inventory for the production product and each of the three products defined. This then makes it impossible to depict any kind of production. Enter another product that is not a set product and mark it as an "In-stock product". Now you would produce the product using an internal order and delivery note. In doing so, the required quantities of the components will be removed from inventory. In order to manage inventory levels, you can then update the previously created "In-stock product" manually under "Products - incoming/outgoing items". For more information about the "Warehouse", please also refer to our helpdesk article "How does the warehouse work? ".